“We are delighted that Joe Plumeri will be Grand Marshal of the 2011 Columbus Day Parade and Columbus Celebration, which this year marks the 150th anniversary of the unification of Italy,” said Mr. Fusaro. “Joe is one of the most dynamic, passionate, positive, and generous men I’ve ever met. Among so many other acts of kindness to worthy causes throughout his career in business of over 40 years, he honored his parents by funding the construction of the Samuel & Josephine Plumeri Wishing Place, the headquarters of the New Jersey Chapter of the Make-A-Wish Foundation. Part of the broader city-wide Columbus Celebration, the Columbus Day Parade is the largest celebration of Italian American culture and heritage in the world. 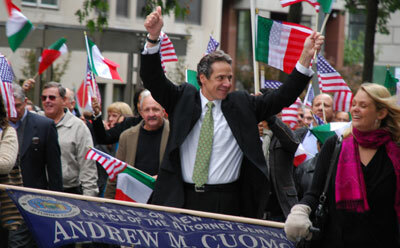 The 2011 Columbus Day Parade will feature over 100 contingents, including virtuoso performances of traditional Italian and Italian American music and dance, street performers, historical and contemporary floats, over a dozen marching bands, and national and international dignitaries. It is broadcast live on WABC-TV beginning at noon and internationally on RAI-TV. "My grandfather came here on a boat from Sicily, arriving at Ellis Island. He figured the best way to become an American was to do American things. So he pursued an unlikely career in baseball: with a thousand dollars he recruited Babe Ruth and Lou Gehrig to barnstorm the country, the diamond heroes inspiring kids at every stop." Joseph J. Plumeri was born in a blue collar neighborhood in North Trenton, NJ. He is the son of Josephine and the late Samuel J. Plumeri, Sr., a Trenton businessman, entrepreneur and community leader. His grandparents immigrated to the United States from Villalba, Sicily. He received his Bachelor of Arts degree in history and education from The College of William and Mary and attended New York Law School. Plumeri’s corporate life started in 1968 at the small brokerage, Carter, Berlind & Weill. He worked with one of the partners, Sandy Weill, for over three decades as Mr. Weill’s small investment firm transformed, becoming part of Shearson, then American Express, Shearson Lehman Brothers, the Travelers Group and, finally, Citigroup. 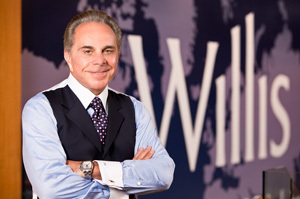 In 1999, Mr. Plumeri headed the integration of the consumer businesses of Travelers Group and Citicorp after the $70 billion merger of the two firms and served a year as CEO of Citibank, North America. 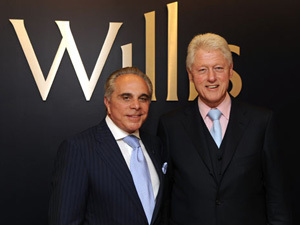 In 2000, he became Chairman and Chief Executive Officer of the London-based Willis Group Holdings at the request of Henry Kravis and his company, Kohlberg Kravis Roberts, which had just acquired Willis. Mr. Plumeri transformed the long-established but sleepy Willis. He took it public, oversaw the construction of a new London headquarters and acquired competitor Hilb Rogal & Hobbs in a massive $2.1 billion merger that doubled Willis’s American presence and solidified its position as the world’s third largest insurance broker. He also negotiated a long-term lease and naming rights to what had previously been Sears Tower, in Chicago, and which is now Willis Tower, the tallest building in the Western Hemisphere. Plumeri owns minor league baseball teams that are feeder clubs to the New York Yankees and Philadelphia Phillies. The Yankee team, the Trenton Thunder, plays in Samuel J. Plumeri, Sr. Field, which he named after his father. Mr. Plumeri is an active philanthropist. He committed $2 million to establish the Plumeri Awards for Faculty Excellence at the College of William & Mary, funded the Joseph J. Plumeri Business Scholarship and created the Joseph J. Plumeri Endowment Fund for baseball scholarships at the college. He provided the largest gift ever made to the Make-A-Wish Foundation for the construction of the organizations New Jersey Chapter Headquarters, now named the Samuel & Josephine Plumeri Wishing Place. He also contributed $1 million to the College of St. Rose in Albany, New York, for the development of the school’s Christian Plumeri Sports Complex, which is named in honor of his late son. Plumeri has been honored by numerous civic and philanthropic organizations, including the Insurance Industry Charitable Foundation in 2009 for his impact on the reputation of the insurance industry, and by the Jackie Robinson Foundation in 2010 for his career achievements. He also has been honored by the Sons of Italy Foundation (in 2008), the Intrepid Foundation, the Boy Scouts of America, and the Make-A-Wish Foundation, among others. He currently serves on the boards of the National Center on Addiction and Substance Abuse, Mount Sinai Medical Center, the Intrepid Sea, Air & Space Museum, the Jackie Robinson Foundation, Carnegie Hall and American Friends of the Churchill Museum in London. He was Commissioner of the New Jersey Sports and Exposition Authority from 1997 to 2004. The Columbus Citizens Foundation is a non-profit organization in New York City committed to fostering an appreciation of Italian-American heritage and achievement. The Foundation, through a broad range of philanthropic and cultural activities, provides opportunities for advancement to deserving Italian-American students through various scholarship and grant programs. During the 2011-2012 school year, the Foundation is providing just under $2 million in scholarship assistance to over 500 students. The Foundation organizes New York City's annual Columbus Celebration and Columbus Day Parade, which has been held under the auspices of the Foundation since 1944. "The 'insurance guy' standing before you was once a rare Italian American on campus. On my first day, my English professor read the roll and called out "Pulmonary." No one answered. I realized he meant me. I spoke up. And this is virtually the first thing I ever said on this campus: 'Professor, I am not an artery'. . . My grandfather came here on a boat from Sicily, arriving at Ellis Island. He figured the best way to become an American was to do American things. So he pursued an unlikely career in baseball: with a thousand dollars he recruited Babe Ruth and Lou Gehrig to barnstorm the country, the diamond heroes inspiring kids at every stop."